The origin of chimineas is shrouded in time. Although popularized and used in Mexico for hundreds of years and eventually making their way here, these clay fireplaces probably date back to the Mayans and similar fireplaces have been used in other cultures. Many of the first chimineas brought here were indeed made in Mexico and because of their relatively cheap price became popular for use in backyard patios and on decks. Some were used as garden ornaments and even as planters. We don't sell clay or terra-cotta chimineas for several reasons and in spite of their lower price we don't recommend you buy one unless you want to use it as a planter. These chimineas are unsafe to use. One must remember these fireplaces were used in warm dry climates and often under cover. They do not handle moisture well and a hot chiminea can break if it gets rained on. They can crack or flake from exposure to cold and moisture and they can fail without warning. Poor Mexican peasants had to work with what was available and mud was free so if a chiminea broke they either built a new one or slapped a handful of mud on the old one to patch it. 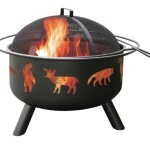 With that said the design of a chiminea is superior to any fire pit or outdoor fireplace. Once started fires burn very fast in chimineas which means they give off very little smoke when starting. 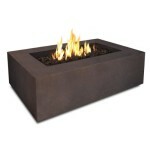 Because of their design they heat up very fast and put out a lot more heat than a fire pit. Their design allows much more airflow meaning much cleaner combustion. They are a better choice for backyard use because they wont smoke and annoy the neighbors and unlike a fire pit because they burn so clean you aren't left with as much ash, charcoal or partially burned wood to clean up. 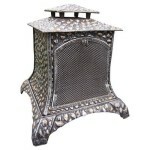 Chimineas made from cast iron or aluminum are the best choices. Many have the traditional chiminea shape but some are quite different and unique in design. Metal chimineas are much more durable and safer than clay or terra-cotta ones. Aluminum is probably the best material for a chiminea because it is lighter in weight and wont rust. Cast iron can stain when it rusts. Copper and stainless steel are also sometimes used and are good choices but will be more expensive. Metal chimineas come with various features. Many have a spark screen and rain cap for the top. Some are designed with a spark screen to go across the fire box opening. Metal chimineas don't necessarily have to be wood burning and some are designed to burn propane or natural gas and are equipped with realistic ceramic logs. If you are considering buying a chiminea its good to remember that you get what you pay for. Stay away from cheap junk chain store chimineas that are made from sheet metal because they will burn out quickly and become useless. One final note: Although it may seem obvious it is important to state that chimineas are meant for outdoor use only. Convert your Blue Rooster Chiminea to natural gas or propane and skip the hassle and mess of using firewood. The Rock Chiminea is a new adaptation on garden hearths. Reminiscent of an old-time country stone fireplace the chiminea takes on the look of a block of granite. The Cast iron Hummingbird & Trumpet Vines Chiminea is simply stunning and will warm up any gathering. Decorative hummingbirds and trumpet creeper vines and their flowers adorn and are in full glory all around this chiminea.